Even if you are unable to make the 3rd Annual Atlanta’s Holiday Hootenanny at Terminal West on TOMORROW, December 22, you can still make a difference! TDawg Presents has set up a simple online donation through PayPal, with all proceeds going directly to the concert and Atlanta Habitat for Humanity! We will run this donation link through Tuesday, December 31 at 11:59pm. Click on the logo directly below to make yours now! You will receive a email confirmation of your contribution that you need to keep for your records and tax purposes. 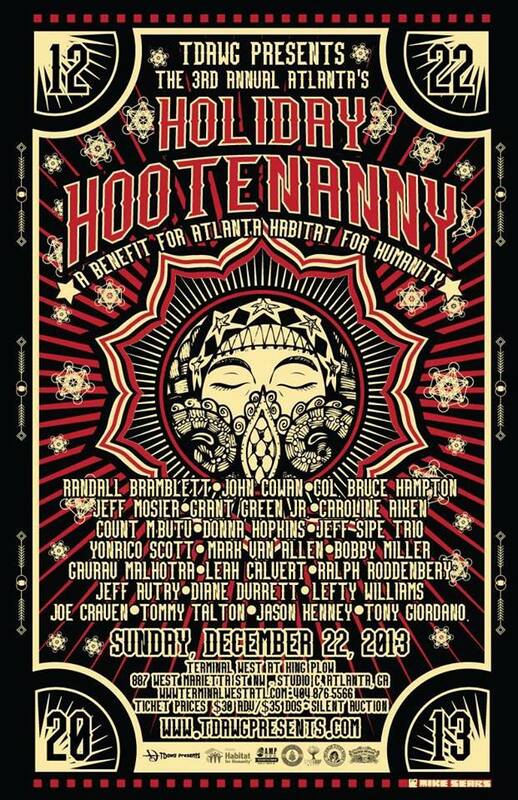 Folks, what has become an annual holiday tradition in the form of Atlanta’s Holiday Hootenanny promises to be around for a LONG time thanks to the support of the music community and the community at large! Atlanta needs to have this show every year – it’s become a celebration by the musicians and all who attend, and by the end of the night you feel like you’ve gone to church! I hope you get to enjoy in person, but if not, making a donation right now is a great way to participate! ← Holiday Hoot Low Down & Silent Auction!